The Air Force Phillips Laboratory at its Starfire optical Range (SOR) has installed the world's largest telescope capable of tracking low earth-orbiting satellites. The telescope has a 3.5-meter (1 l.5 feet) diameter primary mirror and is protected by a unique retracting cylindrical enclosure that allows the telescope to operate in the open air. once equipped with adaptive optics, the telescope will be capable of resolving basketball-sized objects 1,OOO miles in space. 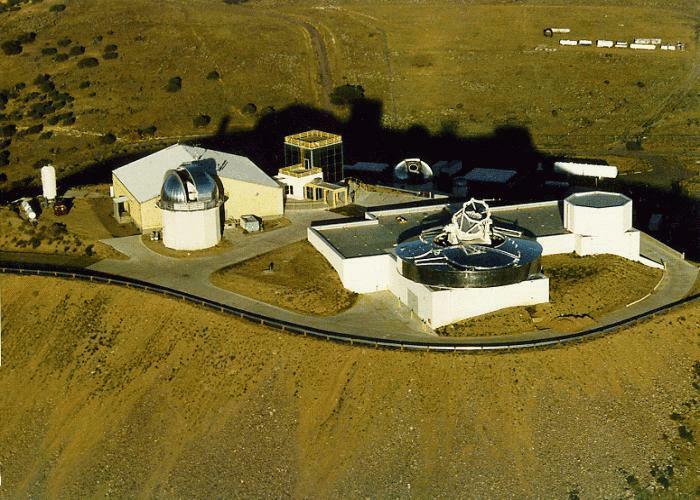 The SOR is a world-class optical research facility located on a hilltop site (6,24O feet above sea level) in the southeastern portion of Kirtland Air Force Base, New Mexico. The SOR is the center for Air Force strategic optical research. The primary mission of the SOR is to develop optical sensing, imaging, and propagation technologies to support Air Force aerospace missions. This 3.5-meter telescope uses a spun cast borosilicate primary mirror fabricated and polished by the University of Arizona's Steward observatory Mirror Laboratory in Tucson. The lightweight honeycomb sandwich primary mirror weighs 4,5OO pounds and has a one-inch thick glass facesheet. The surface is polished to a precision of 21 nanometers, 3,OOO times thinner than a human hair. 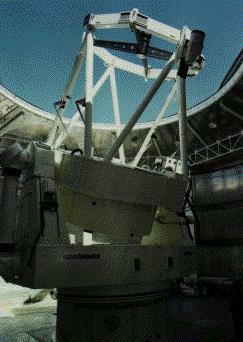 The mirror is supported by 56 computer-controlled actuators to maintain the surface figure while the telescope is moving. The mirror was installed in August 1993, and first light images were achieved on February 10, 1994. A unique feature of the 3.5-meter telescope is the protective enclosure (or dome) consisting of three 9-foot high cylinders each 7O feet in diameter that collapse around the telescope through a 35-foot diameter shuttered opening in the roof. The enclosure is often likened to a collapsing Boy Scout cup. This approach has two major advantages over conventional domes with narrow slits: it does not have to be rotated at high speed for satellite tracking, and it provides complete ventilation of the telescope to ambient air which improves the quality of the images. The effects of wind buffeting are minimized by the telescope's very stiff structure and high-torque motors and by angular acceleration sensors which control fast-steering mirrors designed to optically cancel out the image jitter induced by the wind. Also, in severe conditions the enclosure can be raised partially to shield the telescope. The enclosure was built by Coast Steel in Vancouver, British Columbia, Canada. The telescope, gimbal, optics, and support structures weigh more than 100 tons. The telescope sits on a massive steel-reinforced concrete pier weighing more than 7OO tons which is isolated from the rest of the facility and anchored in the bed rock with long steel rods. The telescope, gimbal, structure, controls, secondary mirror, and auxiliary path optics were built by Contraves USA in Pittsburgh, Pennsylvania. The facility and concrete pier were built by Bradbury and Stamm of Albuquerque, New Mexico. Thermal control of the telescope and facility is essential to maintain the highest image quality. Another unique feature of the 3.5-meter facility is the removal of heat by a closed cycle water system chilled by a large "ice house" located 1/4 mile from the telescope. The concept is to make ice in the daytime and store it in an underground pit for use at night. This approach eliminates heat released into the air near the telescope - as would be the case with conventional air-conditioning systems. The 3O-foot pit under the floor of the physical plant building has storage capacity of 4.5 million pounds of ice. Propane fired boilers can generate up to 2 million BTUs for hot water which is also supplied to the 3.5-meter facility. Very precise temperature control of optical labs and equipment can be achieved by mixing the right proportions of hot and chilled water. The Phillips Laboratory SOR research team is the leader in the development of laser beacon adaptive optics for military applications and for civilian applications such as astronomy. The objective over the next several years is to develop and demonstrate laser beacon adaptive optics on the 3.5-meter telescope. The knowledge gained with the l.5- meter telescope serves as a foundation for advanced techniques which will be used on the 3.5-meter telescope. The first tests with adaptive optics on the 3.5-meter telescope are scheduled to occur in the spring of l995. The total cost of the 3.5-meter telescope, enclosure, laboratories, physical plant and all supporting facilities was $27 million. The research and operations staff is comprised of approximately SO military, civilian, and contractor personnel. The staff includes physicists, mathematicians, astronomers, electronic and mechanical engineers, optical designers and technicians, sensor and computer specialists, laser technicians, a site meteorologist, electricians, plumbers, welders, machinists, and a variety of other specialists.